As the US government shutdown enters its 7th day today it looks as if we shouldn’t be holding our breath unless we want to go blue in the face in the hope that there might be a compromise or somebody might actually cave in. Talk about sticking to your guns. The Republicans won’t come out of it any better than Obama will in standing their ground and refusing to negotiate over all of this as hundreds of thousands get laid off. So, they might have voted back pay. But, will they also be voting that the rent and the mortgage payments and the utility bills and the groceries also be paid at the end of the month? Very doubtful. No point closing the gate after the horse has bolted at all, is it Washington? If only they stopped wasting the people’s money in their stand-off that is holding the US economy to hostage. Getting rid of them all and starting afresh wouldn’t be a bad idea after all. To those that might retort that the ones that follow will be just as bad, should have faith that new brooms might be big enough to sweep away the debris and make a thorough clear out in politics these days. Alternatively, if Washington is looking for money, then they could start looking where the real greenbacks are going, apart from being thrown out of the helicopter to the people down below at the banks, it should be added with haste. The real money is in the havens, but none of the lawmakers or the politicians would ever dare mention that word for fear of alienating the few bucks that are left here in the USA. 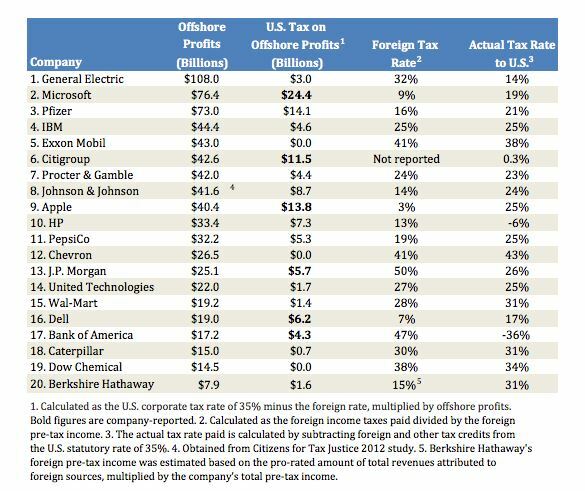 The top 20 US companies listed in Fortune 50 have set aside some $743 billion in profits in accounts located in offshore tax havens. According to Nerdwallet Taxes that would bring in about $119 billion extra for the Treasury if the money were in the US in accounts. Tax-haven talk only gets little more than a few Twitter comments that fall into oblivion or a televised debate at 3 a.m. in the morning that nobody watches. The companies with the offshore accounts have the politicians tied to them, since they are the ones that will make and break their political careers. Hardly going to bite the hand that feeds you, are you? The US budget deficit stands at $642 billion. That could be reduced if the guys in Washington had the gumption to stand up and be counted and get the companies to pay taxes here in the US. 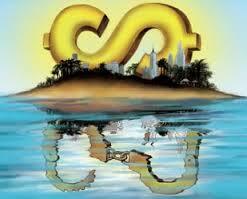 88% of the companies listed on the Fortune-50 list use tax havens to avoid paying taxes in their home country. 68% of offshore profits are generated by the top 10 companies on Fortune 50. General Electric for example has $108 billion in foreign earnings. Coming back to the US would bring in at least $3 billion in income tax for the US. Estimates show that it might pay anything around $24 billion in income tax to the Internal Revenue Service in the USA. Pfizer would end up paying $14.1 billion in tax to the IRS on its $73 billion in offshore profits. IBM pays $3 billion to foreign governments in taxation. It earns $44 billion in offshore profits and would end up paying an estimated $5 billion in the US. Only 6 of the companies that were contacted out of the 20 in the ranking (in the analysis carried out by Nerdwallet Taxes) actually bothered to reply to the information regarding how much tax they would have paid in the USA, had they decided to bring their accounts back to the country. Needless to point out that the other companies in the top 20 stated that it was impracticable to suggest such a figure. That money is offshore today and not in the USA. It is of no benefit to the country whatsoever being overseas, improving just the financial status of the companies and not the US economy. Certainly, the US budget deficit is far from their worries. But it amounts to 10% of Gross Domestic Product of the USA that is sitting somewhere in offshore profits for companies. That’s more than there should be at a time like this. In economic times of prosperity maybe it’s acceptable to do this sort of thing (but even that’s debatable). It’s not just the companies either; it’s private individuals and the world’s rich that have an estimated stash of $21 trillion hidden away in offshore accounts. By comparison, this is by far the greatest worry concerning the flight of capital from our home economies towards tax havens. That’s the conservative figure, since some estimate that it could be worth up to $32 trillion. That’s obviously more than the GDP of the USA and Japan added together. It’s only some 10 million people that have that money hidden away too. It’s not the shady banks and the wheeler-dealers of the finance world that have that money in their accounts either. It’s the bone fide banks of the world. The top banks such as Crédit Suisse and Goldman Sachs. But, then what would Washington end up doing with that extra money? Would it put it to good use, or would it do as Washington seems to do all too often these days and hoard or hand it over to the banks to play gin-rummy with on the stock markets rather than getting it where it should be needed in the economy creating jobs and bringing down unemployment? Getting companies to hand over the dough is hardly going to be easy, but at the moment both the companies and the politicians are just weaseling out of it all for fear of losing their privileged places, while it’s the people that are suffering from their convoluted agreements that seem to be renewed tacitly for successive periods so long as the CEOs stay in power and the politicians keep their seats. How long will those in Washington allow companies to sit on their stash of greenbacks while the country is running a deficit that is in the trillions and they act as if it’s just a few bucks? Ahh that part of globalism that even globalist cant stand? A reverse Marshall plan perhaps? How can you continue the yank "we saved you in the big one"bullocks if Marshall takes back the plan? Course the international parts of Federal Reserve would probs be against your mindphuck for oblivious reasons. Perhaps cause they FIGURED IT OUT FIRST? Who(m) are real miners and who wonder in deep holes? Hint: the earth crust is weakest in central Europe because of its wealth effect or give us your eurodollars we will gladdly give your gold back #truemashup?